Preface: I “drank the cool-aid” early on when it comes to Bitcoin. I bought my first few bits in 2013, made some money and then lost it all again. I’m a firm believer in the technology and I get to work with some of the brightest minds on some of the most intellectually stimulating work, something I believe is the future of finance. I just don’t think it’s the future of remittances in emerging markets (anytime soon). I’m incredibly excited about all the uses (both immediate and those yet to come) around Bitcoin, Blockchain and the incredible potential this piece of technology has. There are, however, lot of individuals and startups that oversimplify things, especially when it comes to remittances. I dislike the oversimplication of anything and in some instances –politics, reporting of world events, science—it can be downright dangerous. I’ll start with the simple view, the story often told and sold, and then with a slightly more detailed look at the reality. Okay, while we’re simplifying, I’ll use simple numbers to make the maths easier. For our example we’ll say that we have Alice, living in New York, and she is looking at sending $1000 to her brother, Bob, living in Bujumbura, Burundi. Much amaze. Such remittance. Very wow! ** This one is the only item that is actually accurate. OK, let’s break things down a bit and work with some real world examples. There are costs involved in exchanging between bitcoin and local, government-backed currency (known as fiat currency). First, there is the cost of acquiring the consumer. Alice doesn’t just snap her fingers and get her US dollars converted into bitcoin. The current state of (or lack of) regulation and the risks of money laundering, with a dash of pressure from banks and international regulators (nasty things like the threat of terror financing) all make for a very cumbersome signup experience. Alice first needs to sign up for an account with a company that can help her purchase bitcoin, either a Bitcoin exchange or another startup that “hides” the bitcoin or the exchange and more technical aspects of the transaction. No matter how slick this process, she’ll probably have to upload a copy of her identity document and a utility statement to prove her physical address. This is very onerous, complicated and invasive, even if it only needs to happen once (initial account registration), especially compared to the ease of walking up to a teller at her bank or supermarket or, yes, an online transfer via Western Union, MoneyGram et al. Also, yes, she can purchase bitcoin from a stranger using a platform that doesn’t require her to verify her identity, like LocalBitcoins, but this is the equivalent of buying cash on the black market and a) not a good idea (due to the security/fraud risks) and b) not something that can be scaled for the larger remittance market. I’m working for a bitcoin company, we’re working very hard to lower these barriers and help people sign up and simultaneously keep the bad guys out of the system. We’ve got a long way to go, but we’ll get there. Okay, Alice is a tech savvy person with access to things like a bank statement (proof of physical address) and driver’s license (proof of ID) and she got an account where she can convert between USD and Bitcoin. Great! Now, once Alice deposited her $1000 the funds need to be “magically converted” from fiat into bitcoin. This happens on an exchange and is the same as the international foreign exchange market (the largest market in the world, by far). It is simply a demand-driven market between different currencies. This means, there must be a willing buyer (“I’m willing to sell you my currency for this price”), a willing seller (“I’m willing to buy your currency from you at that price”) and enough demand, for you to exchange larger amounts of money than just a few hundred dollars, which means there might need to be more than one willing buyer and one willing seller. Alice is a willing bitcoin buyer: she took her $1000 and said “Here’s my money, take it and give me 10 bitcoin”. Someone else (a person, company, hedge fund) must meet that order (or the order should actually already be on the market): “Hey, we’ll give you 10 BTC, for your $1000 USD”. The US is leading the pack in terms of Bitcoin trade volume, with a very liquid market where thousands of bitcoin gets bought with and sold for the greenback. There are many people interested in buying bitcoin and many people interested in selling bitcoin; the market meets at this mid-point between supply and demand. I’ll come back to this point later, but this market is where Alice will get her Bitcoin. Most exchanges (forex, bitcoin or otherwise) charge a fee for their services. They’re running a business, after all. It might be low with BTC-USD transactions, but Alice can reasonably expect to spend between 0.2 and 1% in a transaction fee (between $2 and $10 USD for her $1000 transaction). Granted, some bitcoin startups might zero-rate their exchange fees to incentivise trading, but they are running businesses and need to earn their keep somehow (so they’ll cash in on add-ons or start charging an exchange fee in future). The same way that Alice needed to go through the laborious process of sending in proof of her ID and residence, Bob would need to go through the same steps to get his Bitcoin wallet (or service that will allow him to cash out his BTC). Problem is, where Alice might be used to 4G on her latest smartphone, be an early adopter and technologically savvy, the vast amount of remittance recipients won’t be in the same, fortunate shoes. The cost of onboarding, changing the recipient’s behaviour and reaching them in whatever remote location they should be, shouldn’t be overlooked (the “last mile” of the remittance process). Bob is probably used to the conveniences that come with MoneyGram or Western Union, where he gets to walk into a building out in Bujumbura (or even a small village in the countryside) with a reference number in hand and walks out with a wad of notes. Notes which he needs to pay his bills and buy products from his market. There are some brilliant startups lowering the barriers on the recipient side and, as mentioned above, removing the layers of confusion and complexity, but changing consumer behaviour is incredibly onerous and expensive. Banks in the US are earmarking substantial budgets to educate their customers in how to use the soon-to-be-deployed (to the US) chip and PIN cards. All that will change is that shoppers will need to enter a four or five digit PIN on a pad when they use their cards (as opposed to only signing for it). Even that small behavioural change in the rich, connected, developed world is going to be accompanied with a lot of friction and confusion. Now, exactly as there was a digital market where Alice (or the US bitcoin startup) could trade between USD and BTC, Bob (or his bitcoin startup in Burundi) needs to go to a market where he can exchange his BTC for Burundian francs (BIF). I work for BitX, a bitcoin company that focuses on emerging markets with operations in Nigeria, Kenya, South Africa, Malaysia and Indonesia, so I’m somewhat qualified in commenting on this. It’s no trivial task operating in some of these markets and there’s a good reason why many banks and financial institutions have had limited successes there. Laws, banking and financial legislation (if it exists) is completely different in every country and the effort and cost of doing business in the developing world (as rewarding as it is) is no cake walk. There are some great, home-grown startups with wonderful people and ideas popping up all over emerging markets, but this is going to take a while. And to those of us who don’t partner with enough locals, it is going to take even longer. I’m particularly fond of the Dominos Pizza story: the franchise opened up a store in Nairobi, Kenya and (very briefly) insisted in sticking to their “fresh hot pizza in 30 minutes or it’s free” rule. Nairobi has some of the worst traffic on the continent, they’ve found, and quickly had to pull back the offer (one which, amazingly, is still in place in India). Back to Alice and Bob and just to be clear: there isn’t actually a bitcoin exchange in Burundi. But, let’s assume there was (as it could probably and quickly change in future). 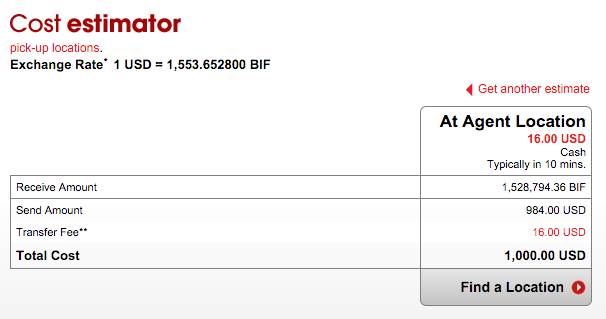 Remember, 10 BTC should be equal to 10,000 BIF which is equal to 1000 USD, the amount Alice sent and the equivalent Bob expects to see at the end of all this. If you look at the exchange volume for USD-BTC transactions, you’ll see a huge amount of money that gets exchanged every day (lots of demand and supply, a very liquid market). In emerging markets, this is not the case. For one, what would the average Burundian, earning only a few hundred dollars in an entire year exactly do with the bitcoin? Sure, one can send it around (virtually free), make a donation to Wikipedia or spend it at Dell or Microsoft online, but the reality is that remittance recipients want their local currency to buy local produce, not something digital and futuristic that requires an Internet connection. Until Bitcoin becomes the global world currency, we can assume Bob and his fellow Burundians need francs, not bitcoin. If they want (or need) bitcoin, it will be in limited amounts, with insufficient liquidity to facilitate remittances at scale. But, in sticking with my theme of oversimplified examples, let’s stick to the assumption that there was a Burundian Bitcoin exchange. Again, there are startups running exchanges in these markets, and I’ll use BitX as example. 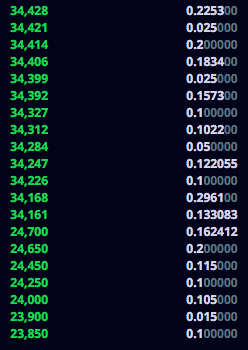 Below is an actual screen grab off the BitX Kenya exchange’s open buy orders. Meaning that people already took their order to the market, saying “If you give me a certain amount of Bitcoin, I will give you a certain amount of Kenyan shillings”. Let’s say, we were selling 10 BTC and want to receive Kenyan shilling for it. Starting at the top line, the first 0.2253 BTC we are selling (out of the 10), will get us 34,428 Kenyan shillings, because someone said they will pay that amount of KES for that amount of BTC, that order is already on the market. Then, for the next 0.025 BTC we’re selling, we will only receive 34421 KES and so on. By the time we’ve sold 2.40652 BTC, I’ll only get 23850 KES for the next few bit’s I’m selling – a whole 10,578 KES fewer than my first few bits! Oh, that’s a difference of over 100 USD at the time of writing. Yes, we will lose hundreds of dollars if we sold as little as 10 BTC in a single transaction. This means, for Bob, where he expected to receive the equivalent of $1000 USD in his bank account, using Bitcoin, he might lose out on more than $500 USD (in Burundian francs) for the transaction! Now, I know there are holes in this example, since if we sold more bitcoin, more buyers might come to market and buy it from me rather than just the open orders on the market, but it loops back to the question: what the hell will they do with the bitcoin and what will incentivise them to trade it in the first place? guaranteeing a fixed exchange rate (also a bad idea, since the only way you can guarantee an exchange rate is if you manipulate the market and use operating/investor funds to artificially prop it up). So, what can Alice do instead? So if Alice sent 1000 USD, Bob would (after fees) end up with 1.5m BIF, which equals 975 USD, in his hands (or 2.5% of the sent amount). Not bad, considering he picked up the cash (very useful to him and the people he’s buying from) at a shop or secure building and Alice completed her transaction online. Incredible, compared to the alternative of onboarding Alice, onboarding Bob, charging 1% on the USD to BTC and another 1% on the BTC to BIF and losing out hundreds of dollars due to low liquidity/bad exchange rates. The true cost of remittance isn’t the digital transmission of funds. Sending money between the US and India or Mexico (two of the largest remittance corridors in the world) is a slick, fast process which takes minutes and can be done entirely online. This isn’t the place where Bitcoin is going to make big waves. The true cost of remittance comes in at the “first and last mile”, getting people to purchase it and to get the equivalent money (after fees) delivered on the other, often remote, side. Digital remittances exist in a lot of places and in places where they are inefficient, they are inefficient for a reason. That reason might be low demand, low liquidity on the fiat forex market, greed and yes, banks and remitters trying to maximising revenue, but Bitcoin won’t fix these anytime soon. Lastly, Bitcoin is technical and complicated, but it isn’t that technical and complicated. 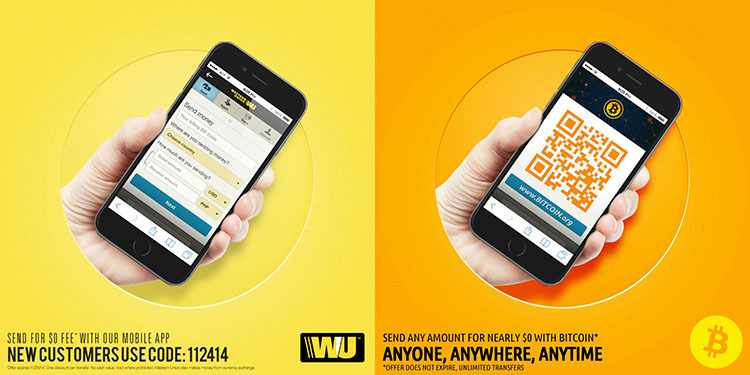 If it was that much cheaper to remit money using bitcoin between two countries using bitcoin (at scale) MoneyGram and Western Union (or the banks) would have started doing so to stamp the competitors out a long time ago. Bitcoin and the blockchain can and will drastically change things in emerging markets, I’m just not convinced that it will be through emerging market remittances (anytime soon). 2. why would i want to exchange bitcoin back to fiat of any kind , just to pay a stupid tax for the in/out? 3. All these bitcoin “apartheid” markets seem like Digital rights management. A human documentation/management tool. Bitcoin was not intended to be used as such. It has been hi_jacked. Comments? Your blogs stimulates my thoughts, zen moments, keep it up! 2. The vast majority of the current remittance market needs fiat at this time, so they’ll need to convert it to pay for basic necessities. 3. I’m not sure I see the DRM comparison: Bitcoin is about inclusion and low barriers to entry. Nobody is forced to use one exchange or wallet over another and everyone has the freedom to send it where they like. Bitcoin has changed and will change a lot in future still, same as any other technology. It’s not about early developer intentions or building a better mouse trap, it’s a financial paradigm shift. Love the feedback, thanks again! 1. Fiat was the incorrect word, could i change that to “proxy”?, kindly comment. 2. Could phone to phone transfers not be the answer? My phone is my bar code and my Global locator. What else does one need, and what better way to decentralize and cut transaction costs. Transaction cost is a big thing. 1% in plus 1% out says i work for the bitcoin_man 7.3 days a year before taxes. x. Does bitcoin lend itself to be traded with conventional trading rules, anyone back-tested their theories, links to trader sites regarding bitcoin shall receive love. I think we’ll always measure value (say “bitcoin” or “gold” or “time”) in a familiar unit like the dollar. Phone transfers could work, but only if they’re decentralised (like with Bitcoin), such as through a Bitcoin app. The transaction costs charged by the telcos are sky high (and network exclusive). The Bitcoin conversion fees (changing from local currency to BTC) will keep going down as more exchanges/competitors enter. The Bitcoin network fees (for sending and receiving Bitcoin) should also improve over time, we’re only at the start of the race right now. There are heaps of Bitcoin trading communities, start at BitcoinTalk. For technical/chart analysis, try CryptoWatch, the Poloniex “trollbox” is a good source of chatter. Note that conventional trading rules and strategies apply to any instrument that gets traded. Bitcoin is however still low in volume, compared to other instruments. Also, join the Bitcoin South Africa Slack group, there’s a #trading channel.